I find Toronto folk singer/songwriter Shawn Clarke to have a very appealing style. He takes traditional folk elements with understated vocals and combines them with witty lyrics, many of which can make a listener chuckle out loud. 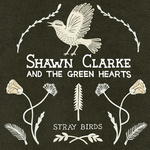 Clarke's latest effort, backed up by The Green Hearts, is an EP titled Stray Birds. The EP comes out officially on December 6th. This is a darker, colder record than his stellar debut full length. These songs tend to have more elaborate arrangements and lyrics that are more despondent. As a result the EP is less welcoming and harder to embrace. There are moments that stand out from the get-go however. "Cold Wind" features stark, desolate imagery with a complementary arrangement. The result is an ideal soundtrack for the bleakest of Canadian February mornings. "Eggshells" is taken over by a rootsy guitar riff that sprawls out into a near-Pink Floyd twang trip. Stray Birds may not spotlight that elements of Clarke's music that I personally enjoy so much, however, it does provide some interesting insight into another aspect of the man's art. Best tracks: "Eggshells", Cold Wind"